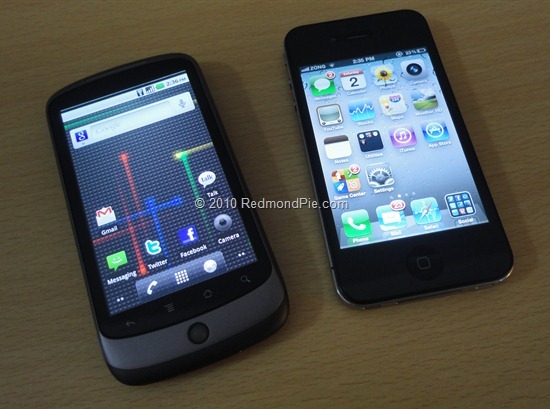 Android Port for iPhone 4 May Soon Become a Reality! Let me get this straight outta the gate: Google’s Android mobile OS is coming soon to iPhone 4!! Android can already run on iPhone EDGE (2G), 3G and iPod touch. The ports don’t work as well as they should do. since iPhone and Android don’t go along well (power management not optimized, iPhone’s battery drops to zero within a few hours) but it’s definitely great if you want to try out the so called open-ness of Android. Ex-Chronic Dev Team member, and the hacker behind the SHAtter exploit for iOS 4.1 jailbreak pod2g retweeted cpich3g and then confirmed (in a reply to @aligreens) that this means that Android will soon be seen running on iPhone 4. We’ll inform you when it is actually possible and available for the general public to try out. We will post a guide on how to do the whole install Android on iPhone 4 thing. Stay tuned! Till then, why don’t you go ahead and take out your old iPhone EDGE from the closet and try out Android on it?